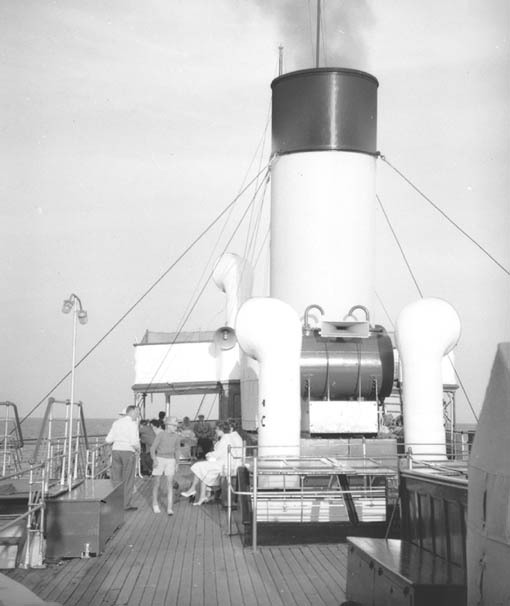 At their January 1967 board meeting, Cosens decided to loose from their employ Capt John Iliffe following their decision to withdraw from steamer operations and sell PS Embassy. They kept on Embassy's chief officer Eric Plater as he was useful to them acting as foreman for their regular maintenance work on the British Railways Channel Island fleet. 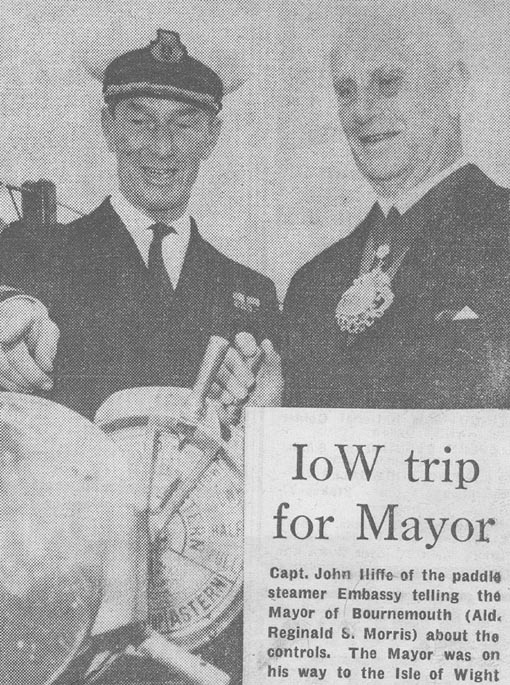 Capt Iliffe on the bridge of Embassy with Bournemouth Mayor Reginald Morris. Born in 1912 (as he often said himself the same year that the Titanic sank) John Iliffe went to sea in 1928 and within a decade had obtained his foreign going master's ticket. He joined the Royal Naval Reserve in the late 1930s. In the Second World War he flew with the Royal Navy but had the misfortune to be shot down over Norway on a mission from RNAS Halston as observer in a Skua on 13th September 1940. Both he and his pilot T E Gray became prisoners of war not finally being released until May 1945. After that John Iliffe remained in the Navy reaching the rank of Lt Cdr before leaving the service in 1958. He then applied for a job with the Channel Island ferries running from Weymouth but was turned down and instead joined Cosens as mate of the Consul then based at Weymouth. I remember being introduced to him, aged 8, by Capt Defrates on the bridge of Consul in 1959 and have a very clear recollection of Capt Defrates saying to me with a chuckle "This is my mate John Iliffe. You can tell he has been in the Navy because he always insists on calling me sir"
When Capt Rawle retired from Cosens at the end of the 1959 season, Capt Haines moved from Monarch to Embassy and Capt Defrates from Consul to Monarch leaving a vacancy on Consul to which Capt Iliffe was appointed. Despite being the most junior mate in the fleet in terms of seniority, he was the only one with a master's ticket. With the sale of Monarch at the end of the 1960 season Capt Iliffe was made redundant for the first time by Cosens and spent the 1961 summer season as master of a gentleman's yacht in the Med. Aboard Embassy on an evening cruise from Swanage. With the departure of Capt Defrates, John Iliffe was back in command of Consul in 1962 and after she was withdrawn at the end of that season moved to Embassy of which he was master for her last four summers so becoming Cosens's last captain. Capt Iliffe was only 55 when he left Cosens for the second time but he never went to sea again. Instead he had a variety of jobs including running an ice cream van which he positioned at the viewpoint above Abbotsbury on fine summer days. It is said that he kept a careful and detailed log of the weather conditions in relation to his ice-cream sales. He lived with his wife in quite a grand house in Buxton Road overlooking Portland Harbour bought doubtless with family or other money as it would have beyond the dreams of the pay scales of Cosens's masters. He was sometimes seen driving a rather natty sports car although he was more often mounted on his his somewhat antiquated Lambretta. Cosens were never great payers, the rationale being that their captains had lots of time off in the winter. I recall Capt Iliffe telling me later in his life that whilst master of Embassy he had bumped into a former AB who had also worked as a fitter in the yard but had left the company for a job as a milkman. He asked the man how he was getting on and why he had left to be told that the £18 a week pay as a fitter was just not enough to feed his family. That rather made Capt Iliffe gulp as his then rate of pay as master was just £16 per week. 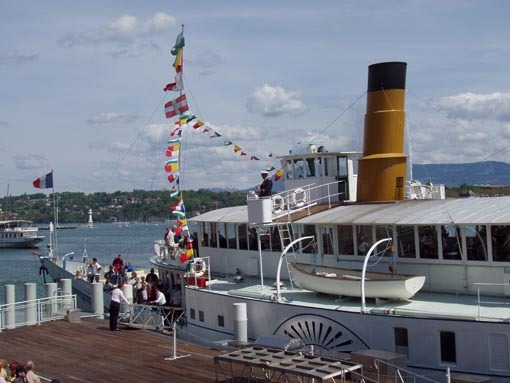 PS Italie alongside at Geneva. 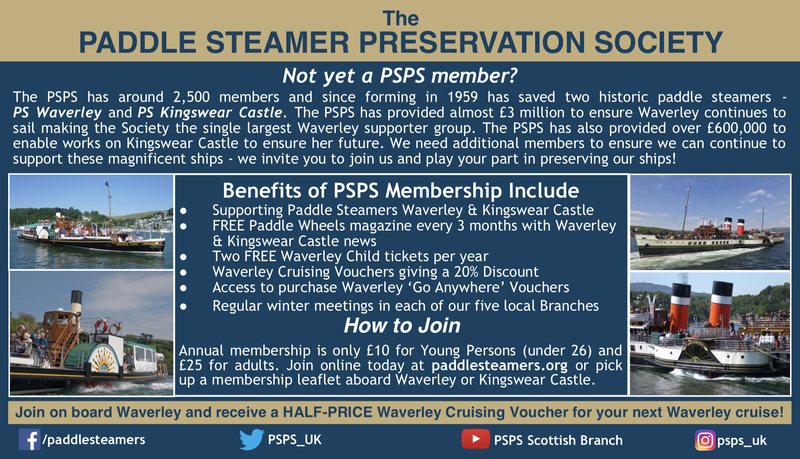 His daughter lived in Geneva for some years so he regularly sailed on the paddle steamers there and became something of an expert on them. Capt J C W Iliffe died in Weymouth in 2002 aged 90.